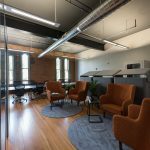 Saratoga CoWorks has opened new innovative space at 462 Broadway in Saratoga Springs. The 3,300-square-foot collaborative space is on the second floor, above BurgerFi restaurant. Nickolas Goupil, an engineer employed by Jeffords Steel and Engineering, sits in his private office with two large computer screens lit up in front of him, displaying engineering drawings and designs he is working on for his Plattsburgh-based company. He works remotely from his office in Saratoga CoWorks at 462 Broadway, part of an expansive 3,300-square-foot space above BurgerFi restaurant. Goupil and his wife moved from Plattsburgh to Saratoga Springs in August and they’ve been working out of Saratoga CoWorks ever since. “With technology the way it is, this makes working remotely very easy for me,” said Goupil, whose wife, Sarah Merkel, occupies another one of the seven private office spaces rented by her company, ETS Staffing, on a yearly basis. 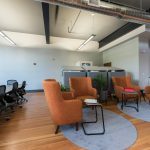 The CoWorks location on Broadway is the second space of its kind. The first Saratoga CoWorks at 153 Regent St., in an historic building owned by drb Business Interiors, is currently bustling with activity from entrepreneurs and professionals in industries ranging from creative to accounting, to thoroughbred racing and “green” technology firms, and software developers to nonprofit organizations. 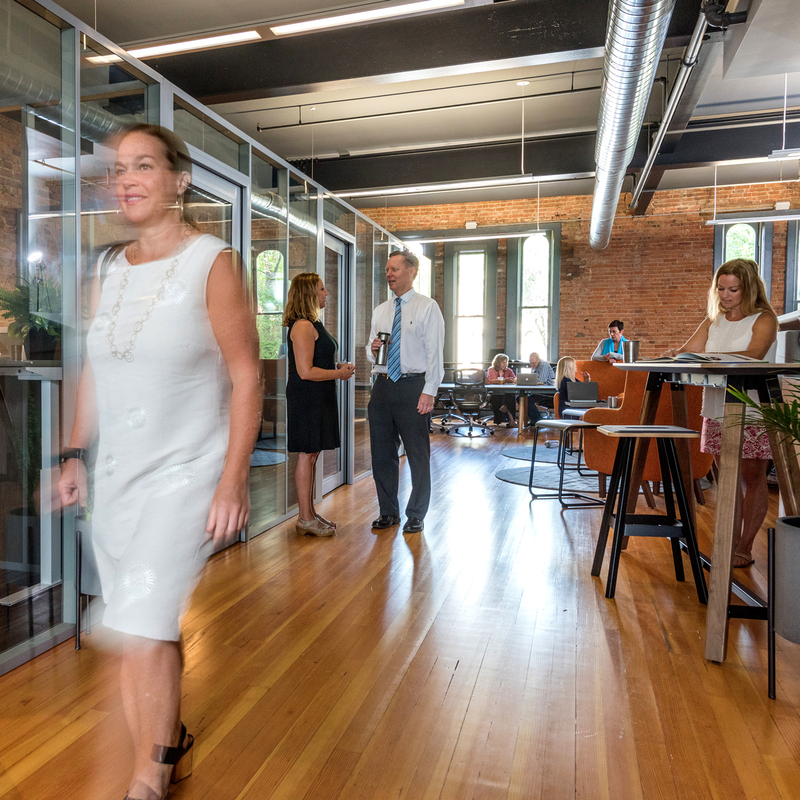 The bottom line, according to drb owner and president Dorothy Rogers-Bullis and her husband, Dan Bullis of Saratoga CoWorks, is the ability for professionals to connect with other professionals. As space at the Regent Street location began to fill up, they realized it was time to expand. According to a 2018 Global Coworking Survey, a total of 1.7 million people will work in more than 19,000 coworking spaces by the end of 2018. Twenty-nine percent of those 19,000 spaces opened in the last year alone. 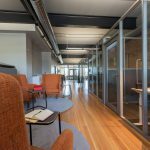 The other trend being seen by analysts is a shift to more expanded work areas, with the average coworking space expanding their areas by about 70 percent. 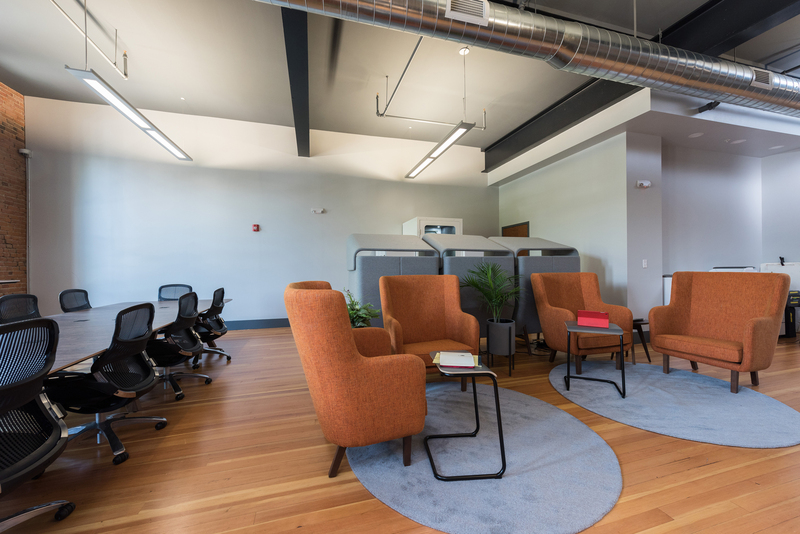 In addition, operators of existing cowork spaces are opening new locations to accommodate their growing clientele base and cement loyalty with their members. 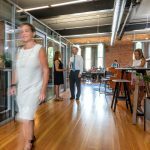 Saratoga CoWorks is right on track with the global trend that is increasingly geared toward this new type of shared work environment. From an economic standpoint, it works for the solo entrepreneur, who is often faced with small rental spaces at high rates, as well as larger corporations looking to reduce the cost of work spaces. Other trends being tracked in the burgeoning industry are a focus on “niche” spaces that will attract like-minded entrepreneurs and give them more opportunities to expand their enterprises through a collaborative working environment. One of the benefits of working in a shared space, as opposed to operating out of a home office, is the chance to interact on a regular basis with other business owners in a mutually cooperative atmosphere, rather than working solo in a more isolated environment. “It’s all about professionals connecting with professionals,” said Dorothy Rogers-Bullis. The couple plans to open a third location sometime in 2020 at SoBro, a mixed-use building on South Broadway that will be built next year. 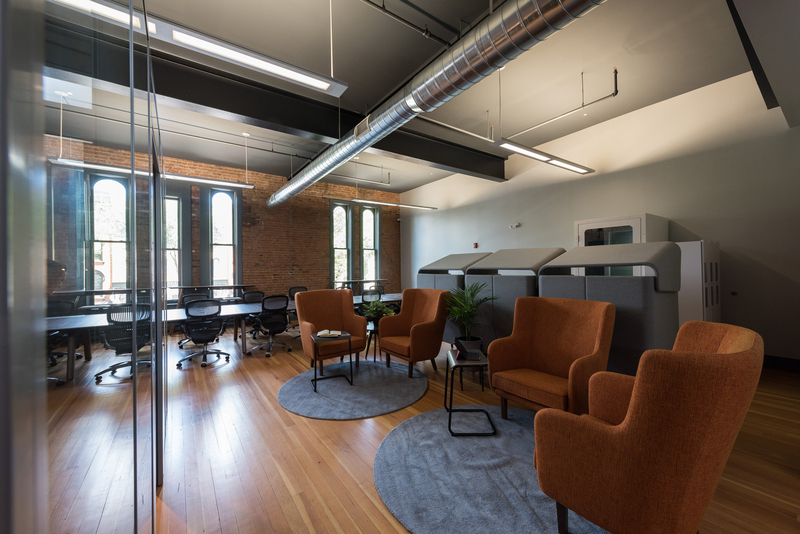 The new Broadway space furnished has top-of-the-line Knoll and other business furniture brands carried by drb Business Interiors. The chairs, desks and other office equipment are ergonomically suited to each person’s needs. The space can accommodate as many as 35 professionals. Spaces are available for a day at a time and up to a full year, with monthly and quarterly arrangements available. There is also a large conference room and a kitchen. Included in the rent is access to Wi-Fi, fax, a printer and scanning equipment. 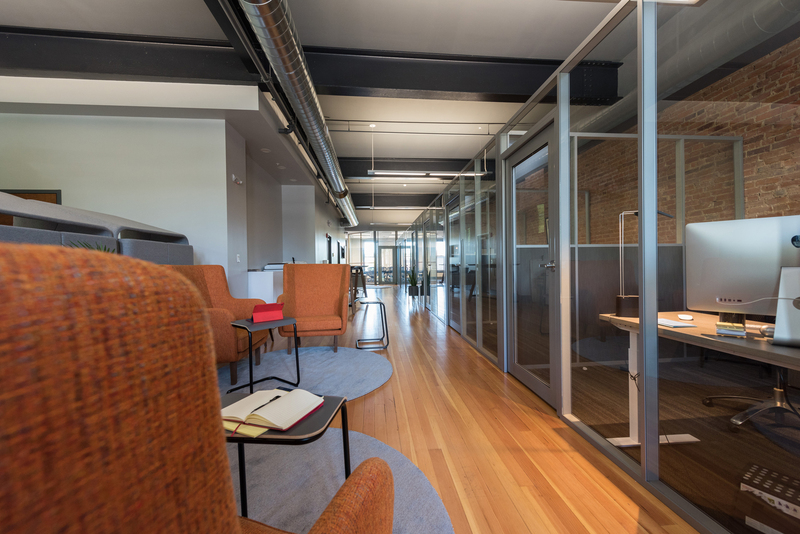 Smaller modular spaces, manufactured by OFS provide private “pods” for making phone calls, working on laptops and connecting with other entrepreneurs. The coworking spaces can be used to host community-focused events. This serves the dual purpose of driving more people to the space and possibly introducing them to a work opportunity they were unaware existed. It also generates additional revenue. Rogers-Bullis said they hold networking events on a regular basis. For new business owners still in start-up mode, having a physical address with space available for client meetings is valuable. To learn more about Saratoga CoWorks, schedule a visit or reserve coworking space visit them at www.saratogacoworks.com or call 518.306.5233, ext. 2.